So How Much Power Is What? 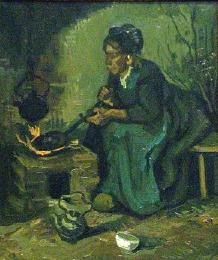 "Cooking" is the application of heat to food. Indoor cooking is almost entirely done either in an oven or on a cooktop of some sort, though occasionally a grill or griddle is used. Cooktops—which may be part of a range/oven combination or independent built-in units (and which are known outside the U.S.A. as "hobs")—are commonly considered to be broadly divided into gas and electric types, but that is an unfortunate oversimplification. In reality, there are several very different methods of "electric" heating, which have little in common save that their energy input is electricity. Such methods include, among others, coil elements (the most common and familiar kind of "electric" cooker), halogen heaters, and induction. Further complicating the issue is the sad habit of referring to several very different kinds of electric cookers collectively as "smoothtops," even though there can be wildly different heat sources under those smooth, glassy tops. As we said, cooking is the application of heat to food. Food being prepared in the home is very rarely if ever cooked on a rangetop except in or on a cooking vessel of some sort—pot, pan, whatever. Thus, the job of the cooker is not to heat the food but to heat the cooking vessel—which in turn heats and cooks the food. That not only allows the convenient holding of the food—which may be a liquid—it also allows, when we want it, a more gradual or more uniform application of heat to the food by proper design of the cooking vessel. Cooking has therefore always consisted in generating substantial heat in a way and place that makes it easy to transfer most of that heat to a conveniently placed cooking vessel. Starting from the open fire, mankind has evolved many ways to generate such heat. The two basic methods in modern times have been the chemical and the electrical: one either burns some combustible substance—such as wood, coal, or gas—or one runs an electrical current through a resistance element (that, for instance, is how toasters work), whether in a "coil" or, more recently, inside a halogen-filled bulb. it makes the cooking vessel itself the original generator of the cooking heat. How does an induction cooker do that? Put simply, an induction-cooker element (what on a gas stove would be called a "burner") is a powerful, high-frequency electromagnet, with the electromagnetism generated by sophisticated electronics in the "element" under the unit's ceramic surface. When a good-sized piece of magnetic material—such as, for example, a cast-iron skillet—is placed in the magnetic field that the element is generating, the field transfers ("induces") energy into that metal. That transferred energy causes the metal—the cooking vessel—to become hot. By controlling the strength of the electromagnetic field, we can control the amount of heat being generated in the cooking vessel—and we can change that amount instantaneously. 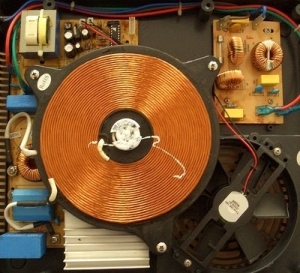 The element's electronics power a coil (the red lines) that produces a high-frequency electromagnetic field (represented by the orange lines). The heat generated in the cooking vessel is transferred to the vessel's contents. 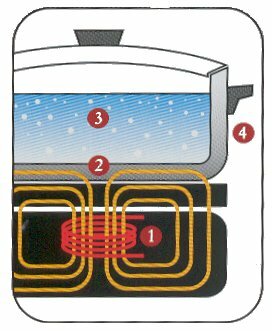 Nothing outside the vessel is affected by the field—as soon as the vessel is removed from the element, or the element turned off, heat generation stops. On the horizon is newer technology that will apparently work with any metal cooking vessel, including copper and aluminum, but that technology—though already being used in a few units of Japanese manufacture—is probably quite a few years away from maturity and from inclusion in most induction cookers. If you are interested in a new cooktop, it is, in our judgement, not worth waiting for that technology. Nowadays there are also so-called "zoneless" induction cooktops (every maker has its own trademarked term for "zoneless', but that's the common term). It rather seems, at this point, as if the mountain has labored to birth a mouse. The original promise of zoneless was a surface on which you could put down any size or shape of cooking vessel in any location or orientation and have everything work. In fact, even that, when once one comes to think it through, is not so very exciting except as it may involve cooking vessels of unusual sizes or shapes—the few things (griddle, grill, fish pan) that don't function well, or at all, on standard circular heating elements; for most pots and pans, having fixed-location heating elements is just not an issue. Well, zoneless has been in Europe for some years, and now is arrived in the U.S. with models from (as this is written) two BSH Group makers: Thermador and Gaggenau. (No doubt there will be more from other makers soon enough—both the Electrolux Group and the Fagor Group have substantial expertise in "zoneless".) The issue on which, in our opinion, these new zoneless units disappoint is capacity: they are 36-inch units, a size one would normally expect to be able to carry up to five vessels—but to achieve the "zoneless" quality, they restrict the cook to a maximum of four cooking vessels at any one time. To us, that seems a big step backward in technology. It would be less disappointing were it not that there are now several units on the market that provide the option for true induction-powered "bridging" between a front-and-back element pair, effectively turning the two into a single quite long heating element, so that exactly the "problem" vessels—grills, griddles, fish pans, and the like—are accomodated perfectly well. There are 30-inch, four-element units with bridges, and 36-inch, five-element units as well. What one might gain over such a bridged unit by going to one that is 36 inches wide but only takes four vessels escapes us. Finally, there is also now such a thing as an induction oven. (The usual heating coil on the base of the oven has been replaced by a ferrous plate, which is energized to heat by embedded induction coils beneath it—so any sort of bakeware will work in it.) Expect to see more such things before long. First, let's define some terms. Energy is a quantity: it's like a gallon of water. In cooking, we aren't really concerned with actual energy—we want to know at what rate a cooking appliance can supply energy. It's like, say, a garden hose: if it can only produce a dribble of water, it doesn't matter to us that if we let it run day and night we could eventually fill many buckets. What we want to know is how forcefully that hose can spray—how many gallons a minute it can put out—because that's what does useful things for us in some reasonable amount of time. So, in discussing cooking appliances, we normally talk about energy flow rates, which are just like the water flow rates expressed in "gallons a minute"—that is, we want to be able to know at what rate we can pump heat into the cooking process. For gas, energy content (quantity) is traditionally measured in "British Thermal Units" (BTU), and so the flow rate of gas energy is given in BTU/hour. For electricity, energy content is normally measured as "kilowatt-hours" (kWh) and the flow rate is just kilowatts (kW). The energy in gas and the energy in electricity just happen to be measured in different-sized numbers, but they're measuring the same thing. It's like miles vs. kilometers: we can say a place is about 5 kilometers away, or that it's a little over 3 miles away, but the actual distance we'd have to walk or drive is the same. 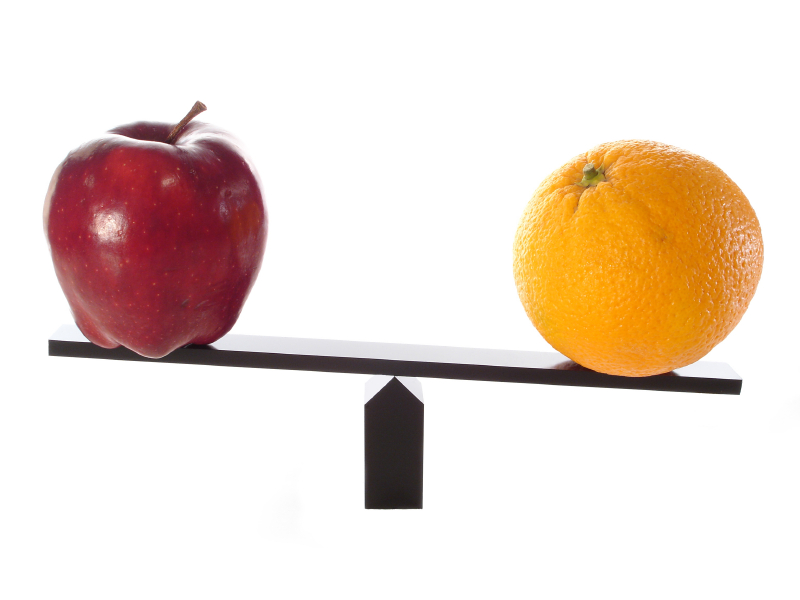 We can easily convert from miles to kilometers if we know how many of one make up the other. Likewise, we can easily convert from BTU/hour to kilowatts (or vice-versa). There are just about 3,400 BTU to a kWh—or, more exactly, about 3,413. (Keep in mind that a kilowatt is 1,000 watts: 1 kW = 1000 W). Superficially, then, comparing cooking technologies looks easy: can't we just look at the rated kW or BTU/hour of a cooktop, and simply convert one kind of measure to the other to compare them? Nope. The complication is that the various technologies are not all equally effective at converting their energy content into cooking heat; for example, gas delivers little more than a third of its total energy to the actual cooking process, while induction delivers about 85 to 90 percent of its energy. That means that if we have a gas cooker capable of putting out X BTU/hour, converting that X to kilowatts does not tell the story—because a lot more of that X is wasted energy that doesn't do any cooking than is the case with induction. To truly compare the cooking power of a gas cooker and an induction cooker, we indeed need to first convert one measure to the other, say BTU/hour to kilowatts; but we then need to slice off from each unit's nominal output the amount that does not get used for cooking. That last term there— Eind/Egas —is simply the ratio of the two methods' real efficiencies: Eind is the energy efficiency of a typical induction cooker and Egas is the energy efficiency of a typical quality gas cooker. The snag comes when we try to find reliable figures for those efficiencies. It is remarkable how much misinformation there is (especially on the internet), largely from well-meaning but ignorant sources who do not understand the issues, or are simply repeating what they read elsewhere (from someone else who does not understand the issues). For example, the energy-efficiency values quoted by various induction-cooker makers range from a low of 83% to a high of 90%, while values given for gas cooking run, depending on the source, from 55% down to as little as 30%, nearly a 2:1 ratio. Fortunately, in the last few years some standardized data from disinterested sources have become available, so we no longer have to rely on figures from parties with an axe to grind. The U.S. Department of Energy has established that the typical efficiency of induction cooktops is 84%, while that of gas cooktops is 40% (more exactly, 39.9%)—figures right in line with the range of claims made for each, and thus quite believable. Because I am tired of answering emails from people who will not trouble to read what they are commenting on, let me make as clear as possible here that the number above is—as is explained in detail just above—not a mere direct conversion of BTU/hour to kilowatts: it is a comparison of the effective actual cooking power of a gas burner and an induction element, a reckoning that requires both converting the energy-measurement units and allowing for the large difference in efficiency of using the energy supplied for cooking. 'Kay now? It is worth noting that the testing method that established the induction data used, in essence, a slab of ferrous metal as the "vessel". It reliably established what might be called a "baseline" efficiency, and that is why we use it throughout in evaluating energy equivalencies. It remains as a possibility that particular items of induction equipment—and, for that matter, of cookware—may be a bit more or less efficient than the baseline. There are at least plausible reports that some makes, coupled with some items of cookware, can achieve true efficiences close to 90%. On this site, we do not use that value because we do not yet know of any definite, reliable data, but you should keep it clear in your mind that when we discuss the gas heating-power equivalencies of induction units, we are using what should be considered rather conservative numbers; chances are that many induction units are actually somewhat more powerful (in BTU/hour equivalents) than we set forth. In fact, Panasonic states for several of its units that efficiency is 90%, noting that: Heating-efficiency measurements were taken based on standards of the Japanese Electrical Manufacturers' Association and using a Panasonic standard enamelled iron pot. Also: a University of Hong Kong research product showed induction efficiencies from 83.3% to 87.9%, numbers clearly in line with 84% as a minimum and 90% as possible. When one moves from stock home appliances up to the deluxe level (sometimes called "pro", though ironically the warranties for such units expressly forbid commercial use), gas ranges and cooktops naturally become more powerful. On these, burner powers run up to 18,000 BTU/hour or thereabouts (one highly regarded specimen of this class has four 15,000-BTU/hour burners and two 18,000-BTU/hour burners). One expert source remarked of such gear: Most commercial-style home ranges offer 15,000 BTUs per burner, which is perfectly adequate for most at-home cooks. You won't always need all that heat, but if you want to caramelize a bell pepper in seconds, or blacken a redfish like a pro, well, you'll need all the heat you can get. My advice: Go for the big-time BTUs (which, in the tests he was discussing, was that 18,000 BTU/hour level). So how do actual real-world, on-the-market induction cooktops stack up against gas? and a large element of 3.7 kW (over 26,500 BTU/hour). So, in sum, induction is not "as powerful as gas"—it's miles ahead. 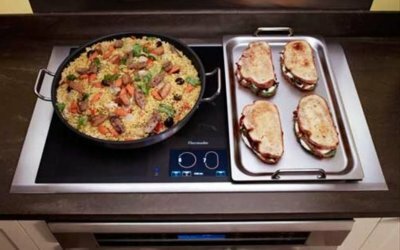 (There is a much more substantial discussion, which we strenuously recommend anyone at all interested in induction-cooking equipment read, on our site page titled Kitchen Electricity 101). So now that you know how induction works, and how—at least in raw cooking power—it compares with gas, let's go on to examine in more detail all the Pros and Cons of Induction Cooking. This page was last modified on Saturday, 17 June 2017, at 4:13 pm Pacific Time.